I told you all I’d try out a banting lasagne and let you know if it was worth the effort – actually I have to tell you it more than was – in fact I think I’d never go back to normal lasagne after trying this out! There isn’t a huge amount of preparation in it after all. I thought because I was making a different type of white sauce that it would take ages – it didn’t as it happens. Oregano and thyme, and salt and pepper to taste. 1 cup beef broth – I had none so just used veg stock. 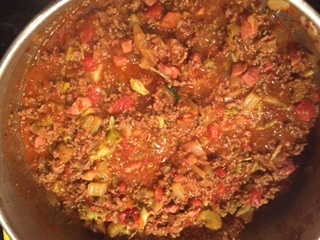 The mince mix was lovely – and as you can see there is absolutely nothing there that is not family friendly and “normal”! I browned off the mince and bacon then took it out of the pan. I needed a bit of olive oil to grease the pan then threw in the onion, garlic and celery to saute down. I then threw the mince mix back in and added all the other ingredients and left the lot simmering on the hob for about forty minutes. aubergine or courgette sliced to resemble pasta sheets. I then made the white sauce – incredibly easy and so unbelievably tasty. 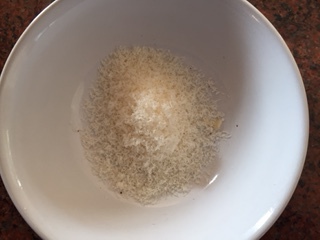 I boiled up the cream in a pot and threw in the grated cheese – I had the thickly grated stuff from Lidl but the lighter grate might dissolve more easily – it still happily dissolved away. Then I added the nutmeg and some salt and pepper. I waited until just before assembly to add the egg yolks as I was a bit worried that they might scramble! To assemble I sliced aubergine and put it in a layer at the bottom of my lasagne dish. I then dolloped on a generous portion of the meat mix. I repeated the process twice more then covered the lot in the white sauce – having remembered to add the egg yolks to it. The lot went into the oven at 170 degrees celsius and it cooked until it smelled right – about 35/40 minutes. It was glorious looking when it came out of the oven. The sauce on top looked as if it had curdled slightly – it still tasted delicious. I had a small portion – it is really rich and very creamy. The aubergine was unnoticeable which I always think is a very positive thing to say about aubergine! 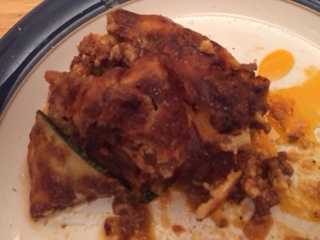 The courgette I would use again – it actually added to the flavour of the dish. This was a real winner of a dinner. The best part? It has satisfied my need to freeze – I made the recipe and it made 6 portions – so I have two extra dinners for Paddy and me for some cold winter’s evening when we land in and and have nothing in the fridge. The other thing which really pleased me about this dish is the fact that it was the first dinner we ate that felt like our “usual” food – in that we ate something that was a one pot dish – banting up to now for us has involved meat and a side. This feels more like the food we’d eat in a major rush week – so it’s good to know that we can adapt this food plan to how we live as well as adapting our lives to the food plan. The other recipe I made today – actually I made three more but I’m trying not to overshare! – was seafood chowder. It is tomato based and is an absolute dream dish – so easy to make and again a great staple for my freezer – did I mention my freezer? Actually I have three – a throwback to being one of nine children with two very busy parents – my childhood memories are of my mother baking in bulk every weekend and stocking the chest freezer for the 11 of us. So I have a thing about not running out of food – I need to have stores just in case! Hence the three freezers. The fact that there are only five of us in this house seems a moot point – the freezers stay. 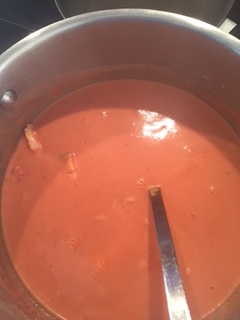 I put the passata and the cream into a pot and boiled it up – I also added some garlic – I have a great garlic mill that grinds it like black pepper – think I got it in Lidl or Aldi ages ago. 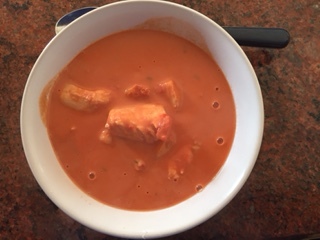 Once it was boiled I turned it down to a simmer, added the red wine and threw in two packets of seafood mix – a combo of white fish, salmon and a bit of smoked. I let that cook down for about seven minutes and that was it. 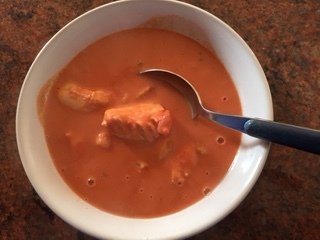 A healthy wholesome chowder – tomato based but lovely nonetheless. I served it as you can see with some grated parmesan under it just for the hell of it – it went down a treat. 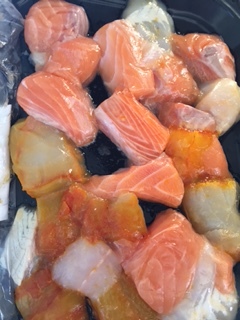 A second bowl was had – and yes – I have three more portions for lunch next week sometime – see those freezers are very handy! I will let you know how the cottage pie tastes next time, as well as offering some less sugary ideas for Halloween Treats. I hope our friends aren’t offended when my offering is more banting than baking! Previous PostPrevious Banting desserts – is there such a thing? October 26 2015. Next PostNext Cottage pie, but not as you know it. 29 October 2015.